I would be remiss if I didn’t say anything about this sad situation. Once again, a mother and father will be burying their son due to an unnecesary officer involved shooting. The disturbing issue with this murder is that it was captured on amateur video. The video surfaced after the police officer provided his version of events. He did not tell the truth. The article below provides additional information about the murder of Walter Scott. My thoughts: Why did Walter run? I don’t know, but did he deserve to be fatally shot in the back? Absolutely not! I can appreciate the fact that when the department learned of the officer’s deception, they moved swiftly with charging him with the appropriate crime. Was it Officer Slager’s intent to go out and kill an unarmed and running black man that day? I do not believe so. Did he make the wrong decision by firing his weapon 8 times at the fleeing Walter’s back? Absolutely! 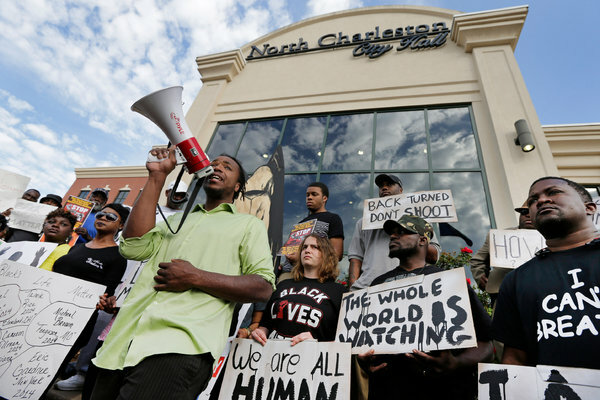 Demonstrators gathered outside of North Charleston City Hall on Wednesday morning to share their accounts of what they said was systemic racism. Video | Video Shows Fatal Police Shooting In video provided to The New York Times, a police officer in North Charleston, S.C., is seen shooting an apparently unarmed man after a scuffle following a traffic stop. 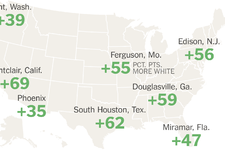 Interactive Graphic | The Race Gap in America’s Police Departments Hundreds of police departments across the nation have forces with a white percentage that is more than 30 percentage points higher than the communities they serve. Video | Reaction to Walter L. Scott Shooting Family members of Walter L. Scott, a black man shot to death by a white South Carolina police officer, reacted after the mayor of North Charleston said the officer would be charged with murder. This article, video, and pictures are found at NYTimes.com. The feature image was found at gma.yahoo.com.